65 years ago, on 26th July 1953, a small band of courageous Cuban revolutionaries stormed the Moncada Barracks in the city of Santiago, in Eastern Cuba. 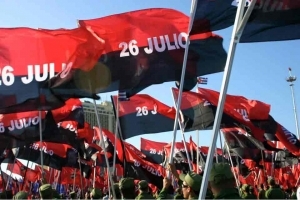 Though that uprising did not overthrow the dictatorship of Fulgencio Batista, it was the beginning of a movement, the 26th of July Movement, that changed Cuba and reverberated around the world. As Fidel said himself, the assault on the Moncada Garrison did not mean the triumph of the Revolution at that time but it showed the way and outlined a programme which would shortly achieve socialism in Cuba. Five tears, five months and five days later the Cuban Revolution triumphed. The Cuban transition to socialism was rapid and extraordinary, establishing the sovereignty of the people over the land and its resources. By the end of the 1960s the new government had overhauled Cuban society in the interests of its people. Large industries and services were nationalised. Agrarian reform was introduced in which land was no longer a commodity and land speculation was abolished. These measures dealt an immense blow to imperialism and the capitalist class. The Cuban government introduced an exceptionally effective literacy campaign and the introduction of free public education at all levels. Free universal health care was introduced. The Cuban Revolution defied all attempts at imperialist intervention and continued to construct a socialist society under the leadership of Fidel and the Communist Party of Cuba, demonstrating many achievements and tremendous social benefits to the Cuban people. It also maintained a solid commitment to socialist internationalism, to the fight against capital and to the anti-imperialist struggles of all those working to transform the world. Ambassador in Ireland on this historic event. The Workers Party continues its solidarity with Cuba and maintains its efforts to end the unjust and criminal embargo/blockade.